Mei contacted us a few weeks back asking about creating a website for their Chinese restauraunt, Hot Wok, located in New Iberia, LA. Mei had a website prior that allowed for online ordering, but the company had went out of business about a year after they made her site. Unfortunately, she had invested in having them make her a website, but the website was proprietary. Therefore, when they went out of business, Mei los her investment on that website because it was not transferrable. Once the initial payments were made, BsnTech got started right away and had most of their new restaurant online ordering website completed in just 24 hours! 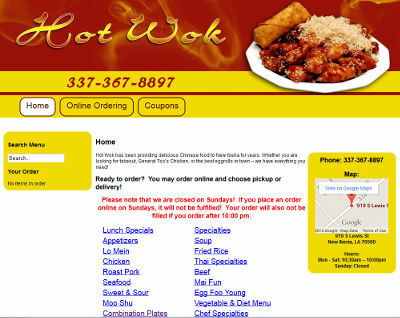 The Hot Wok website has about 240 different items that can be ordered from their online menu and the customer can either choose to pick it up or have it delivered. No online payments are made with their website – it just enables their customers to order online and pay upon pickup or delivery. After the site was up, we then needed to make custom modifications to the order e-mail so that they could print it out on their receipt printer. Their receipt printer had paper that was about 3-inches wide. So several changes need to be made from the generic order e-mail so it would fit easily onto the receipt paper. Finally, Mei also requested that we setup online coupon codes. She had two coupons that she sent to us and wanted to have put on the site so they could be printed – and provided us two coupon codes so customers could redeem them upon making an online order. We appreciate the business from Mei and hope that her new restaurant online ordering website will be beneficial! The Hot Wok website is at hotwoknewiberiala.com. Car Dealership Website Design For Cobbs Car Company, Inc.